Eingebettet in die Bäume an einem Hügel, ist es direkt gegenüber dem North Fork Stream, der sich die Straße entlang schlängelt. Wir nennen diese Kabine unser Hillside Hideaway. Es ist eines unserer großartigen Hotels in der Big Pine Canyon Road, nur 5 Gehminuten vom Sundance Resort entfernt. Die Kabine bietet die perfekte Mischung aus rustikalem Charme und modernen Annehmlichkeiten. Es ist ein tolles Hotel für einen erholsamen Bergurlaub. Es gibt zwei Kaminöfen, darunter einen im Hauptschlafzimmer. Der große Raum hat an drei Seiten große Fenster, die den Raum mit viel natürlichem Licht und herrlichem Blick auf den Wald durchfluten. Entspannen Sie sich auf der großen Terrasse, die die Kabine umgibt. In den Sommermonaten können Sie hier unter den Sternen speisen. Im Winter können Sie sich nach einem Tag auf der Skipiste im Whirlpool oder in der Sauna aufwärmen. Die Badezimmer sind sauber und komfortabel. Die untere Ebene Badezimmer verfügt über eine separate Badewanne und Dusche. Die Sauna ist in der unteren Ebene befindet sich Bad auch. Dies ist eine große familienfreundliche Unterkunft. Es ist in der Nähe des Ortes, erschwinglich, und private mit vielen Annehmlichkeiten. Beautiful and so relaxing! Everything you could ever want at your fingertips! The property was amazing and so beautiful. Upon coming the first afternoon, the staff had lowlights on and music playing to greet us. Made us feel at home and welcomed. The kitchen had everything you could ever want for cooking and Brad and his staff were amazing. They booked a reservation for us for dinner and when one of the heater quit working Brad immediately came over and got it going again. Love this place and totally recommend it to anyone who wants a peaceful beautiful place to stay. We stayed here with our family of 8 and it was amazing. The rental company was beyond helpful. The cabin was cozy and clean. We had 6 kids and they loved the zip line swing and park area. We just wish our stay was longer! Perfect week getaway for family summer vacation. We have a 16 yo son and 12 yo daughter. We did stuff during the day and were at the house in the evening. Best way I can sum it up...we never went out for a single breakfast or dinner the whole week. Why would you? big kitchen , living room, grill...we took the downstairs big bedroom as the master, gave our daughter the foldout in the other downstairs, and let our son have the upstairs BR. Worked out well since the TV was in the downstairs BR. Loved the close distance to sundance, to the national forest, to the trailhead for Timp and Stewart Falls. Middle of nowhere but you are 15 minutes from Orem and grocery stores, etc. Again- perfect week. Thank you Glenn and Julie! You were just a pleasure to have as our guest in Hillside Hideaway. It sounds like you stayed very busy during your week. It's so great when we have guests that get to stay longer than a couple of days to really enjoy everything the area has to offer. Thank you and we look forward to getting you back again soon! The property is in immaculate condition and Stuart Mountain Lodging was very proactive with their communication. If I ever return to Sundance, I'll be staying here. Vicki steered us Perfectly. They have a lot of properties to choose from and she was the consummate professional and Extremely nice. The property was in great condition and the home was stocked with all of the goodies you would expect from a professionally managed property (down to the dog biscuit for our dog) We will use this company again FOR SURE and I am highly confident in recommending Stewart Mgm in Sundance!! It's because of guests like you that keep us going Rob. We love what we do and we are extremely passionate about Sundance and sharing the experience. Like minded people are drawn into Sundance and those that appreciate it and see it for what it is keep coming back again and again. Thank you for being so gracious and we are anxious to get you back. We all have dogs here and they spend their days in the office with us, in our cars when visiting guests, running the trails and tromping through the snow when we have down time. So happy Monty gets to travel with you and we know you'd all love it here again this summer. Let's take the dogs hiking sometime. We'll see you again soon! 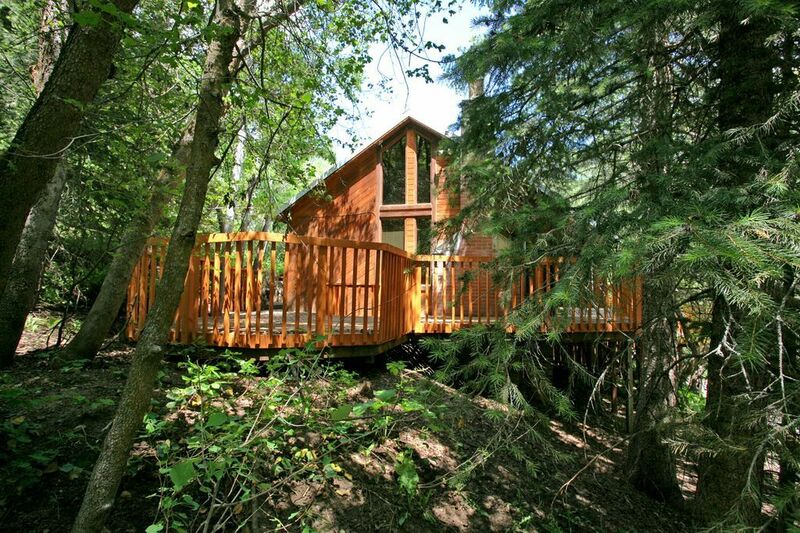 This is a beautiful well-appointed cabin nestled in the trees with beautiful fall colors. We were only there for one night wishing we could have stayed longer. If we ever get back to Sundance, we will definitely stay here again. Diese Unterkunft wird von Stewart Mountain Lodging angeboten und bietet Zugang zu anderen Annehmlichkeiten und Eigenschaften in der Nähe. Sie werden unsere Zip Line Swing und Fire Pit lieben, ganz zu schweigen von der persönlichen Gastfreundschaft und dem freundlichen Service Ihrer Berggastgeber. Wir würden diesen schönen Ort gerne mit Ihnen teilen. Mögliche Aktivitäten in der Umgebung: Snowboarden, Langlaufen, Schneemobilfahren, Abfahrt / Ski Alpin, Wellnesscenter, Schneeschuhwandern.